Shared intentionality refers to the ability to form beliefs and intentions shared with other individuals such that the state of being shared is known to all, and that the participants can predicate these mental states of a collective subject: “we think”, “we intend”, etc. It is a crucial cognitive ability that underlies the human capacity to engage in collaborative action (Bratman 1992), follow and enforce norms, and create social institutions (Tomasello & Carpenter 2007). 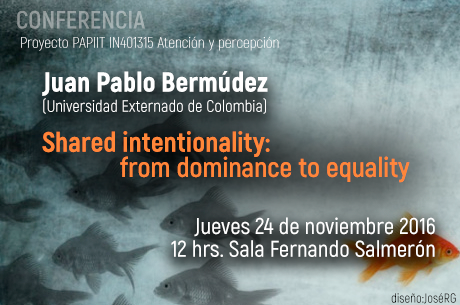 In this talk we argue in favor of two theses: 1) the ability to form higher-order intentional states is necessary, but insufficient, for shared intentionality; and 2) the extra condition required for shared intentionality is the ability to adopt an attitude of equality toward others. We argue for these claims on the basis of experimental results from comparative primatology. These have shown that chimpanzees can form higher-order mental states, in order to engage in complex competitive social interactions that can even include deception and counter-deception. These interactions imply that a chimpanzee A can represent the mind of a chimpanzee B as representing in turn some content or intention in the mind of A. Despite this remarkable ability, experiments from Tomasello’s lab comparing children and chimpanzees suggest the latter do not, and probably cannot, think in terms of “we”. What extra ingredient would transform the ability to form higher-order intentions into the ability to share intentions? We argue that the missing element is an attitude of equality. As long as minds view each other only strategically, the ability to share intentions is blocked. Socially embedded in the dominance relations of a strict linear hierarchy, chimpanzees seem to consider each other only strategically. Appealing to evidence from developmental psychology and experimental game theory, we show that this attitude of equality develops early in human babies, and later on allows us both to engage in shared attentional situations, and to act on the basis of fairness motivations. Although the attitude of equality is mentioned in some empirical work, it is largely absent from the philosophical discussion of shared intentionality and joint action. We unpack some of the rich implications that this has for these growing philosophical debates, for neighboring discussions on moral psychology, and for our understanding of how we are able to act together in the complex ways that shape our cultures and societies.